Having a tiny babe in the middle of cold & flu season has me pulling out ALL the stops to prevent us (and him!) from getting sick. I'm not much of an over-the-counter medicine kind of girl unless things go really south, so I try to rely on more natural remedies as much as possible. 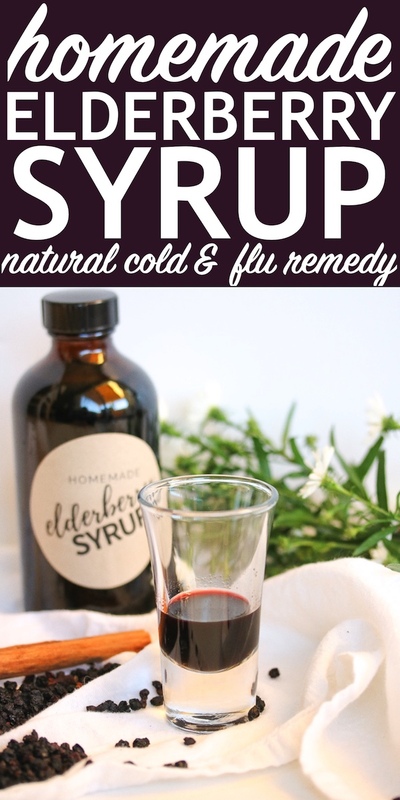 Prevention is the name of the game, but having something natural on hand to actually fight the cold & flu symptoms if they do happen is also so important. 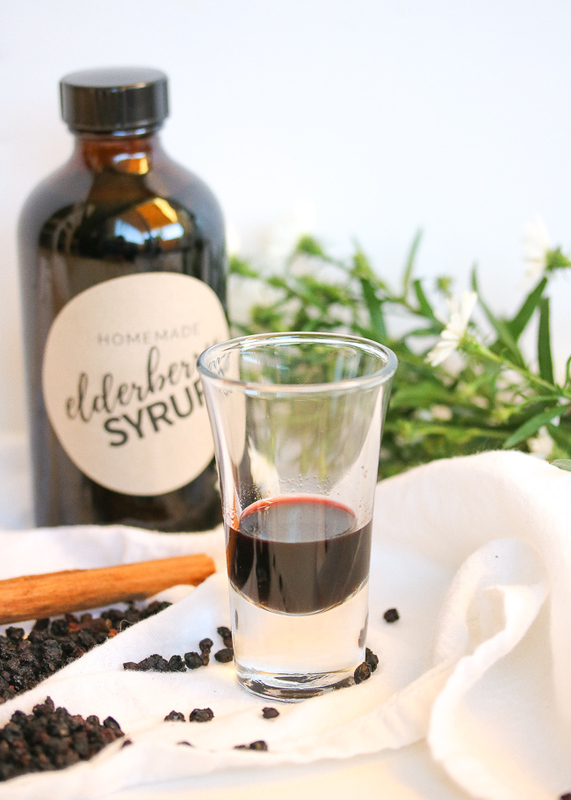 Elderberry does BOTH: prevents & treats. And it is magic! To be honest, I'm more of a convenience person than a DIY person- even if it means sacrificing the budget a bit. But there are a few things I think are worth the bit of effort. One is cleaning supplies (because they're just so easy): see my post about those HERE. The other is this syrup. It is so, so easy you guys. And once you purchase the ingredients, you can make several bottles at a fraction of the cost. Plus it just feels really cool to say that you made your own medicine! It's also super gift-able, especially during this time of year. This is what any loved one who stops by to visit baby is getting to take home with them. Tastes surprisingly yummy (even the non-healthy folks will tolerate it) and is just SO good for you. *talk to your doctor & do your research, but these are just some of the many benefits I've learned of myself! 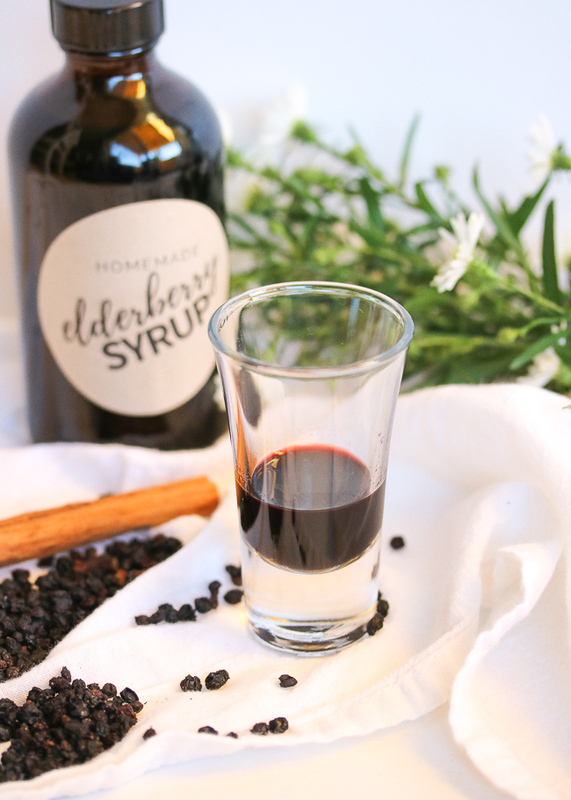 Elderberry Syrup can be taken year-round to boost the immune system, or it can be taken more short term if you're looking to prevent the cold & flu during its peak season. We're being extra diligent about it right now to keep ourselves healthy around baby! We take one tablespoon serving per day. If/when you do get sick, you can take a dose every 2-3 hours to treat symptoms- until you feel better. Then get back to the daily serving. We store ours in these glass bottles. I pour in the warm syrup, let it fully cool, then store in the refrigerator for up to 4 weeks. If you know how to can or use mason jars to get a really good seal, you could probably make it last longer- more like months! You could also freeze once cooled. We tend to use ours up really quickly, so long-term storage isn't super necessary. To label the bottles, I used kraft brown adhesive paper & made a template that I can print. See below under "tools used" for downloading my PDF! I figured I'd share it with you guys to make it super easy! I hope you guys give this a try! I promise you, it is so, so easy to do. And makes such a heartfelt gift to anyone you want to keep healthy! PS: Click the links listed in the recipe to see the exact ingredients & tools I use! I get everything on Amazon which is super convenient- and easy to find organic. Combine the elderberries, water, cinnamon, cloves, and ginger in a large pot over medium high heat. Bring to a low boil then reduce to a simmer. Continue to cook at a simmer (partially covered with a lid, ajar enough to let steam escape) until the liquid is reduced by about half, about 30 to 45 minutes. Turn off the heat, and allow the mixture to steep for about 1 hour or until the syrup is mostly cooled, and just "warm". Strain the syrup through a wire mesh strainer or cheesecloth, pressing down on the berries with a spoon (or squeezing if using cheesecloth) to get all of the liquid out. Whisk the honey into the warm juice until dissolved, and you are left with a thickened syrup. 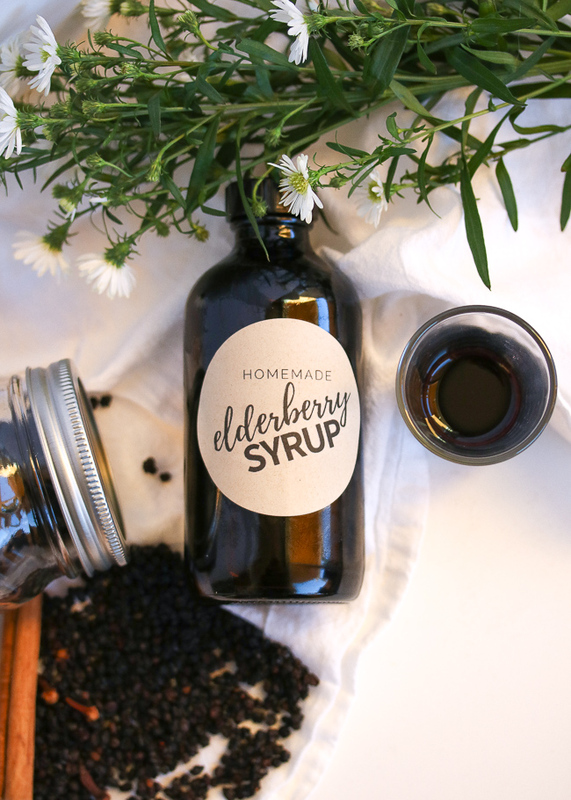 Pour into glass bottles or jars and store in the refrigerator for up to 4 weeks. Adults take one tablespoon per day. Kids take one teaspoon per day. Take one dose every 2-3 hours, as needed. 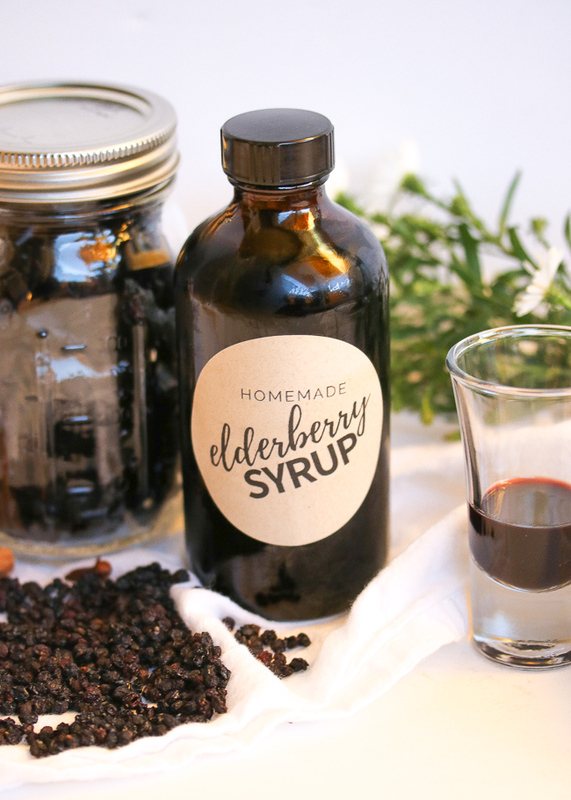 If using fresh or frozen elderberries, double the amount listed in the recipe. Substitute an equal amount of maple syrup if making this for babies under 1 year, to avoid the raw honey. Feel free to double this recipe like I do, if you want to make more jars at once! 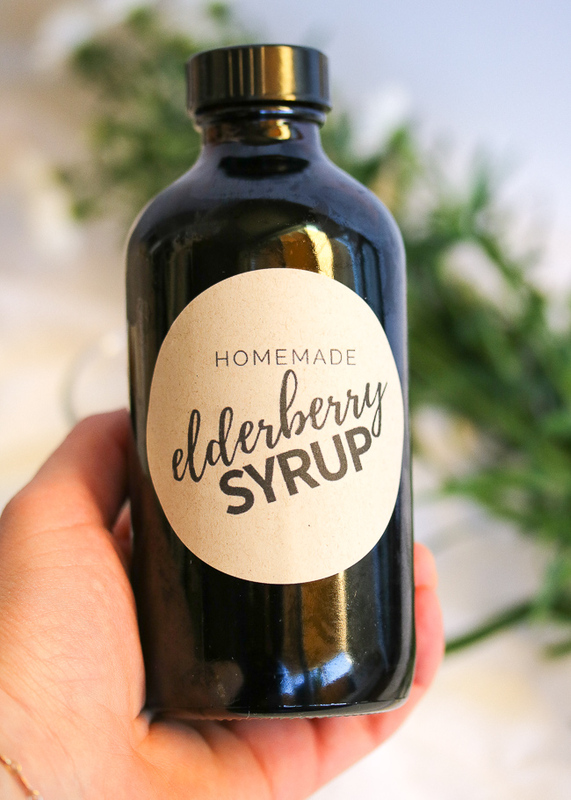 Where do you purchase your dried elderberries?